Nice chair: Solar System Chair. Have a taste for modern funky furniture? Well this is your stool! The ball chair is quality crafted from stainless steel and has chromed steel legs that will charm any room! It may look uncomfortable but trust us this stool has class, style and is so comfy you won't want to get up! Here's another one that's a bit more traditional: OK Hand Chair. Limited space in your dorm room: You may need a Computer Bed. This model of European Murphy Bed is in the popular computer bed format. We have manufactured this concept since 2002 without the advantage of a metal bed frame and wooden slat foundation. Now both are available here. Operation is from gas assisted pistons often referred to as intuitive in nature. 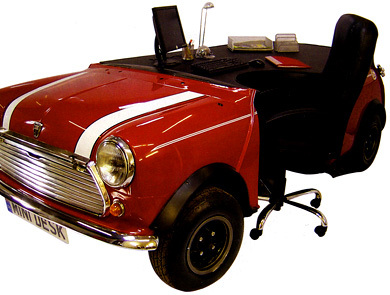 In reality the gas piston dampens the natural action of weight transfer from bed to desk to bed. We love this transfer of responsibility. It is the Murphy Bed concept to perfection. In addition to the program layed out here in pricing and sizes, the Denver factory can customize this system to your personal design. 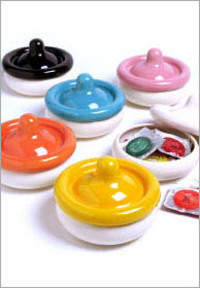 A cheeky bedside storage vessel for condoms (or anything else that takes your fancy) made from natural earthenware and with a choice of five great flavours. High gloss lid in the shape of a rolled-up condom. The QuasicadeFX is the ultimate arcade system for the ultimate game room. 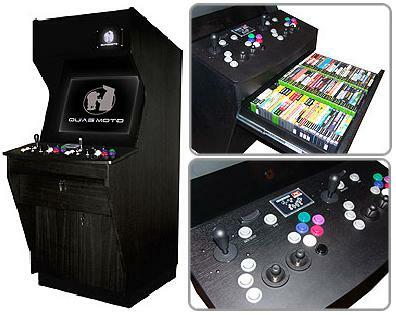 The system has all the great features of our award winning Quasicade Pro, but moded into a sleek black oak package. A 27" High Definition (480i, 480p, 720p, and 1080i) monitor fills your field of vision with amazing picture quality only available when combining next gen consoles with next gen monitors. Two way satellite speakers pump high fidelity audio at ear level, and a high powered subwoofer drops heart thumping bass for a totally immersive gaming experience. At the heart of the QuasicadeFX is the patented QuasiCON 2P Control System, which has been intergrated into a matching black oak case. Play your favorite PS2, Xbox, GameCube or PC games in true shoulder to shoulder arcade style. Also features an awesome stainless steel CNC routed plate on the marquee that is backlit as a finishing touch!